The pattern can only be made for personal and Charitable use according to the site but wouldn't it be fun to make for a new baby or toddler for a gift? 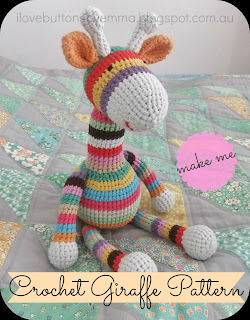 Please do not copy the pattern just redirect others to the site in order to crochet the giraffe for yourself or as gifts. Take your little explorer on a safari with this beautiful afghan and pillow set, the perfect complement for any child's room. Bright colors and tall giraffes make this one-of-a-kind creation something that will make any of the kids in your life smile. Stitched from worsted-weight yarn, afghan measures 36" x 45", pillow is about 12" x 20"and toy is 15" tall. Handmade toys are special.You will find over 18 designs, including a lion, tiger, hippopotamus, primates and more. All made using worsted-weight yarn. Also included is a crochet basics, embroidery stitches and finishing touches section. Crochet adorable security blankets for baby!Four little zoo animals: Gigi Giraffe, Chica Bonita, Eli Elephante and Lionardo. Each is attached to its own small blanket to comfort and watch over its precious little recipient. Crochet using worsted-weight yarn. "Inspired by the Japanese craft trend Amigurumi, these crocheted critters from Amy Gaines are lively little folk, with jobs, friends and adventures. Thoreau is a gnome who practices law and grows mushrooms. Beatrix Hedgehog is an art teacher/hairstylist. O"